We elected to go through On The Go Tours for a 9-day tour through Egypt. This was our experience on the seventh day which took us around Luxor before ending with an overnight train back to Cairo. These last two days proved to us how difficult this itinerary would have been to undertake on our own. All of these amazing temples and tombs are very far from each other, and in most cases far from the city. Taking a city bus just would not work. You would have to hire a driver, taxi or rent a car to get to them. However, renting a car is not recommended. Egypt is very much a country a foreigner should not attempt to drive in. There are no rules. On a two-lane road, a car will overtake another car as a vehicle in the next lane speeds toward them. And do not get us started on the language of horns (but briefly: one to say hi, two to say look out and three to say up yours!). Photography was forbidden in the Valley of the Kings, so sadly we have no photos. This is one location where colors are the most well-preserved, and seeing the artwork with their original colors was a highlight of the tour. It really helps you get a sense of how everything looked 4,000+ years ago. The temples were not beige, they were red, blue, white and more. And the pyramids, it is said, were covered by a layer of limestone with their tops glazed in gold. 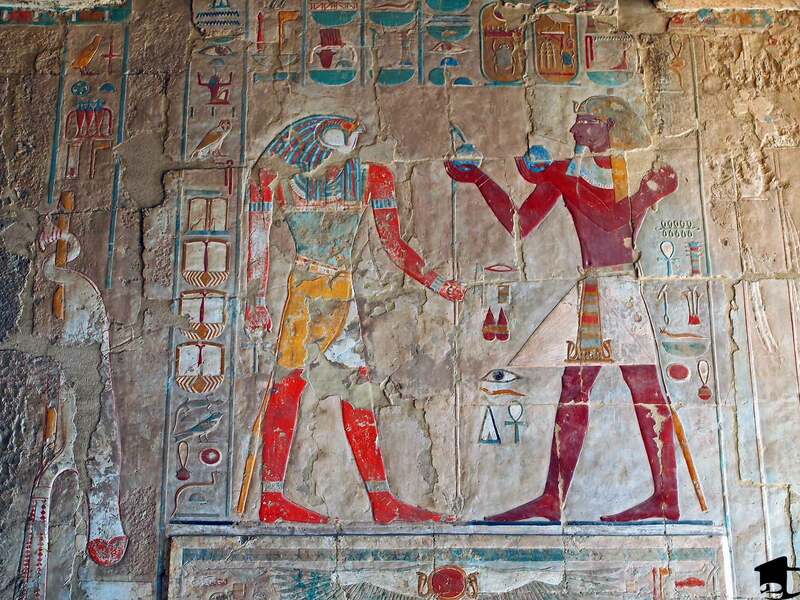 Colorful depictions in the Temple of Hatshepsut. So what is the Valley of the Kings? It was the successor to the pyramids after the pyramids were raided by tomb robbers and pharaohs wanted their mummified bodies and treasures left untouched. So workers cut tombs in a valley that was below a pyramid-shaped mountain (they believed a pyramid was the quickest way to reach the sun god Ra in the afterlife). The tombs were meant to be hidden and unreachable, but tomb robbers found them anyway. One theory is that the workers themselves robbed the tombs. Anyway, the only one found intact was King Tutankhamen’s. It took an Englishman, Carter, five years to find the tomb, then 10 years to unload all its treasures. On the walls of King Tut’s tomb, and every tomb in the Valley, are colorful carved hieroglyphics and depictions of gods, goddesses and the pharaoh. King Tut’s tomb’s treasures are mostly on display at the Egyptian Museum in downtown Cairo, which we visited on the last full day of our tour. The Mortuary Temple of Hatshepsut (two ways to attempt to say her name are: Hat Cheap Suit and Hot Chicken Soup – though we think the first way works best) is a beautiful three-story structure, dedicated to the sun god, carved into the side of a cliff. Statues, carved depictions and hieroglyphics adorn its walls. Although ravaged by later pharaohs, the structure has been restored and was one of the highlights of the tour. Some original colors can still be seen, though they are very faded. She always depicted herself in a manly way to garner more power to rule her kingdom. So in her temple, images of her more closely resemble a male than female. Also, Hatshepsut is the only female pharaoh whose tomb is in the Valley of the Kings (separate from this temple). 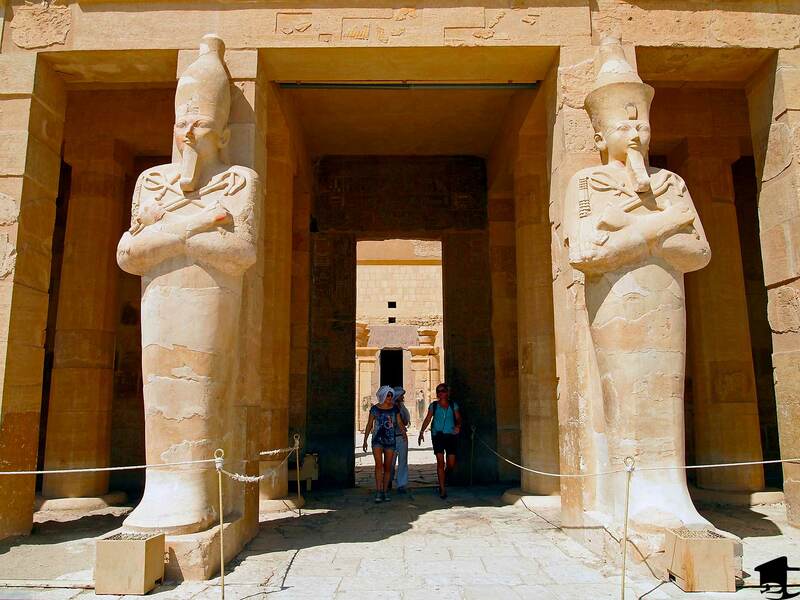 Larger-than-life statues in the Temple of Hatshepsut. Before we tell you about our last sight of the day, let us discuss flies. Not the bzzz bzzz kind – the touts. The first time we encountered the follow-you-til-you-buy-something touts was in Turkey. They nearly ruined Turkey for us. We hated them. And we will forever hate the question “Where are you from?” (which we’re asked very often) because of them. After that experience, we encountered them again in Morocco and Egypt. But now we are kind of immune to these bothersome flies. After leaving each sight, if we were not interested in buying a scarf, galabiya or paperweight pyramid, we kept our eyes forward, mouths shut and hopped back on the bus. For people traveling through the country on their own, these flies (even if you’ve encountered their likeness before) can really ruin Egypt’s image. With the temperature hot year round, most tourists get worn out and tired, and that is where the touts can easily put you over the edge. Dealing with 20 or 30 intense “salesmen” at each stop can really wear you down. In this way, our tour helped us see through the flies. Egypt is hurting right now because of a lack of tourism (for somewhat obvious reasons, like the Arab Spring and the recent protests), and these flies are desperate for any money they can make. Wages in Egypt are low, and these people are just trying to do what they can to feed their family. And they are not even ripping you off – some of them offer really great deals. Eighteen postcards for 83¢ USD is an awesome deal. Now that that’s been said, let us wrap up this tour. The last ancient temple we visited was Karnak. It’s a monstrous complex built on 62 acres in Luxor. It’s a wonder to marvel at. 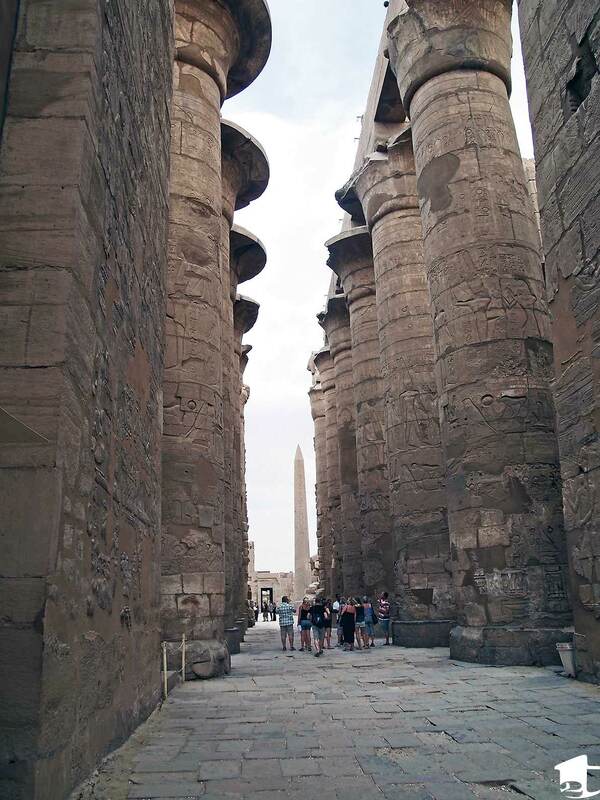 It is filled with pylons (the large structures used as the entrance to each temple), obelisks, statues, hundreds of columns and thousands of stones. Just in case you breezed over this fact: it’s built on 62 acres of land. Built without modern tools and machinery. Built without steal and concrete. It was built to stand on its own. The obelisks were placed exactly at zero degrees, and one of them has withstood the winds and rains of thousands of years and is still standing tall in its original spot. Restoration work is ongoing for the temple, via the use of cranes and other modern-day machinery. 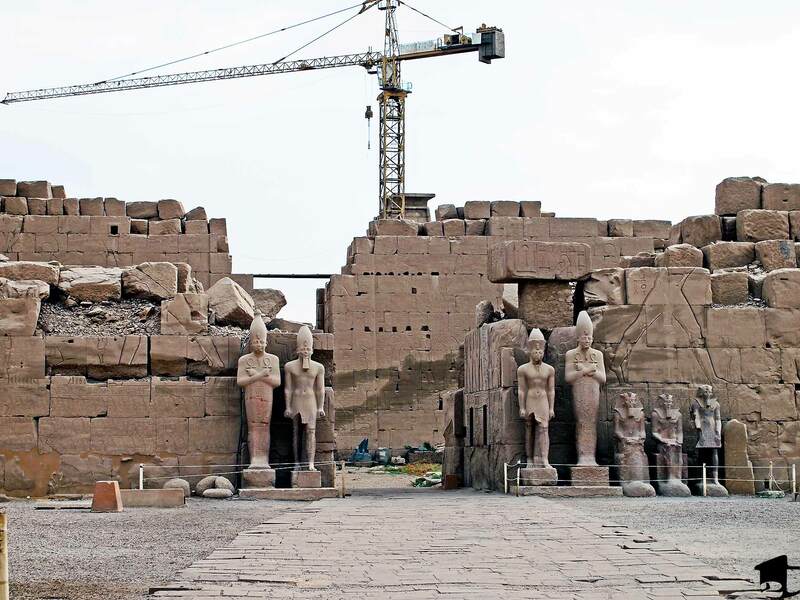 A modern-day crane restoring ancient Karnak. 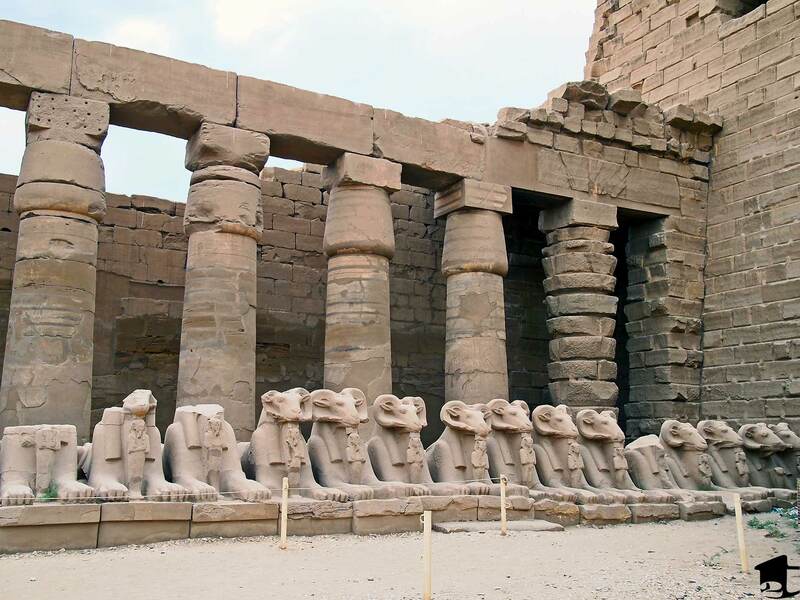 Pillars and ram’s head statues at Karnak. After a day of being fascinated by an ancient civilization, we boarded an overnight train headed back to Cairo. For more on Day 4-5 – The Nile, click here.